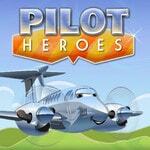 Operate plane in game Pilot Heroes and carry out missions. Rescue people, collect crystals and turn aside from obstacles meeting on a way. Improve the skills of control of airplane and feel the present pilot.